BONUS! Mind-bending black light poster inside! Your Mother Wears Pilot Boots is the fiftieth comic issue, released 28 July, 2010 in the US. It's Mom's Birthday, so her sons bring her a cake. After slapping them, and in the process blowing the candle out, she asks what is on the days agenda. Larry reminds her that it is time for her annual week long, youth restoring beauty treatment. She leaves and puts her sons in charge. At Planet Express, the crew return from a delivery to Planet Camouflage. They are late because Hermes insists on planning the routes despite Leela knowing shortcuts, due to concern she'll become corrupt with power. At Halley's nightclub, Amy and Kif are unable to get in due to not being cute enough. When Amy learns that she is the one who isn't cute enough, she runs off crying. Meanwhile, at MomCorp the three sons have difficulty dealing with the unions and their competitors. In Zoidberg's office, he scans Amy, who appears normal. But then Kif enters and Amy's cuteness levels drop 50%. Evidently his cuteness is overpowering hers, so she decides to give him a makeover. At MomCorp; Walt and Larry have dressed Igner in a fatsuit and wig in an attempt to trick the competition into thinking Mom is still there, but he can't concentrate and they all find it too disturbing. Outside, Walt decides to turn the next woman they see into a new mother, and they see an angry Leela. After trying on the fatsuit, wig and a pair of sunglasses, she decides to take the opportunity to show Hermes that she can handle responsibility. The Union Bot returns and she convinces him that she'll fully unionised the plant , but first he needs to remove all non-union body parts. This reduces him to a head, which she kicks out the door. Amy makes an attempt to make Kif less cute puts him in a yellow suit, with the tie being too tight and causing him to be unable to breath and be even cuter than before. Dad and Uncle Toby, who had previously announced their intent to take over MomCorp, arrive to speak with her sons, only to see someone who they think is her. Leela is able to identify that Dad is a mutant and Uncle Toby is from the future, she then uses this information as blackmail to take control of their companies and make them janitors. The sons return to give Leela her next task, but she kicks them all in the head and has them taken away. Amy has made another attempt to reduce Kif's cuteness, but he now resembles a cute video game character. She gives up and breaks up with him. Igner arrives at Planet Express, having been sent by his brothers to get the Professor in the hopes he'd be able to stop a fake Mom as well as he stops the real Mom, but he forgets and he goes to Luna Park with his father instead. Walt and Larry enter Planet Express looking for Igner and inadvertently alert Fry to what Leela is doing. At MomCorp, Leela is blackmailing all of the competition. 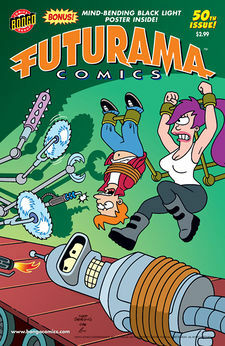 Fry and Bender enter the conference room using Walt's key, but can't convince Leela to leave. At Planet Express, Zoidberg points out to a crying Amy that she is far happier with Kif and she'll have to choose between being cute or being happy. At MomCorp Leela has her friends taken away, but just as she is about to close the deal Bender removes her glasses, showing that she isn't Mom. Fry and Leela return to Planet Express. Amy has given Kif flowers to apologise, it turns out he's allergic to them and is now unattractive as a result. At MomCorp, Mom returns to find the union problems gone and her main competitors scrubbing the bathroom and rewards her sons with a trip to the amusement park. This was the first issue to be released after the beginning the second run. This is the first issue to note the Bongo Comics Group website on the cover. It is also the first to feature a cover image that extends to the back cover. 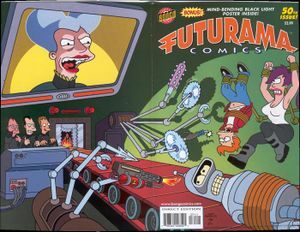 200 copies of this issue, signed by Matt Groening, were available at SDCC 2010. Mom's language seems to have been toned down from its usual level of vulgarity. Fry and Bender almost break the fourth wall. Fry notes that "every couple of months something exciting and dangerous happens" to them. Bender says there are only six pages left, but is actually referring to his Calculon coloring book. Igner previously requested to wear Mom's fatsuit in "A Fishful of Dollars"
As per the events of Bender's Game, the Professor and Igner are aware they are father and son. Later he is dressed as a "Bashful Boy" from "Super Jumpio Bros 7"
The MomCorp conference room resembles the Galactic Senate from Star Wars and one of the companies is represented by Gungans. E.T. the Extra-Terrestrial is also in the conference room. Fry assembles a group called "Fry's Eleven" to break into the Momcorp building. Igner's name is misspelled "Ignar", which was, until recently, believed to be correct. Mom's competitors claim to have approached MomCorp's stockholders to take control, but Mom owns 99.7% of the company. Halley's has apparently been open long enough to pass Earth every 75 years, just as the comet it is built on does, however when we last saw the comet in "Crimes of the Hot", there was no nightclub. When Kif and Amy are talking when they are in line for Halley's, Amy is wearing lipstick, but when she asks the Robot Guard for Halley's if she and Kif can go in, her lipstick is gone. This goof also occurred in "Amazon Women in the Mood". The first of six "mind-bending" black light posters. 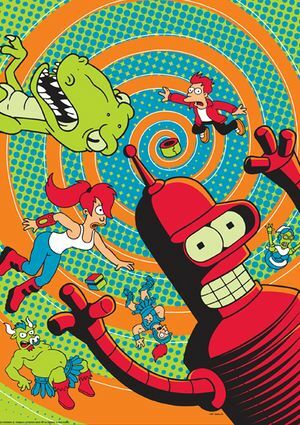 The poster is a recoloured variant of Futurama: The Time Bender Trilogy's cover. This page was last edited on 30 August 2013, at 19:44.